Don't Throw Away Your Shabby Jeans! Cause we have an interesting tutorial that might help your lovely old jeans/denim to stay with you. We are turning your old jeans into a backpack! yes, a backpack, not a tote, not a handbag, but a backpack! I must warn you guys before you decide to read this tutorial. There will be a lot of pictures involved here, so be prepared. - Fabrics or the accent. note: You might find some differences between the photos and the explanation. In case if you noticed something different in the pic and in the explanation, we apologize for any inconvenience. This is the jeans that I used. This is a bright blue 3/4 denim. Each jeans has its own distinct and unique features. We can use those features to make the bag looks more interesting. There are a few parts of the jeans that we can use, while others can be thrown away. 1. Remove the back pocket, the belt loop, and other parts that you don't want to use or you want to keep. For this tutorial, I will take out the ornaments and the pockets. The size of your jeans will affect the final bag size. This time, I will make a medium-size backpack with measurement around L 37 x H 26 x D 14 cm. Because the jeans that I used wasn't that long, I cut it 30cm from the top and added another fabric around 10cm on the bottom. If your jeans is long enough, you can cut it directly 38cm from top plus 1 cm for sewing allowance. Fold jeans, mark with tailor chalk. Remaining of leg part of the jeans. Use one part for the strap. Cut one leg into 4 parts so you can combine it and make a longer strap. In this tutorial, the length of the strap is 9 x 71 cm (after the combining). It's not long enough, but adequate. If you have longer remaining the leg part, you can make it to 9 x 117. Now we will use the other part of the remaining leg for the flap. First, open one side of the leg seam. Then "straighten" the curvy areas by cutting it down. Since I'm planning to make a rounded flap, fold back the leg into a half, then cut it into the shape of the photo below. You can make any shape you want (square, rectangle, rounded in the corner, etc). For this tutorial, the size of the remaining fabric for the flap is L 26 x H 25 cm. After the cut, the top smallest top part is 19,5 cm and the widest is 26 cm. Unseam the crotch area until near the zipper (front) or until the curvy line ended. Flatten the fabric. Sew back the area that we just unseam. Sew it with thread that has similar color to the original color. Sew up to the zipper closure area. Cut the bottom part if it wasn't neat and straight enough, then sew it with the extension fabric (F). Sew the 10cm part of the fabric together. Meet the good side of the extension fabric with the good side of the jeans. Sew together. To add the accent on the pocket, cut the top fabric until the original seam allowance. Meet the good side of the pocket with the good side of the accent fabric (Fabric D). Sew around 1 cm from the top. Fold the unsewn part of the accent fabric around 0.5 cm. Top sew the accent fabric. Repeat these steps for another pocket. Put the pocket around 4 cm above the bottom. the side of the body. I also decided to put back the pocket. Of course, you can always leave the back pocket there from the beginning. Meet the good side of the flap fabrics (the jeans and fabric A). Sew the top side. Now turn the flap so the good sides are facing you. Prepare a bias binding with size around 70cm x 4.5 cm. Sew the bias binding around the flap. Now we're going to sew the fabric for the closure string (Fabric E). Fold both sides and meet them in the middle, then fold in half again. Sew. Sew also the open end. 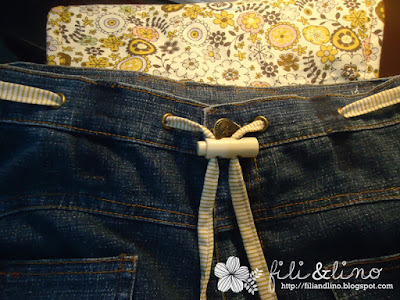 Sew both threads to the back side of the waistband. Give space around 18cm between both. Now sew the flap on the middle-back waistband, covering the end of the string that we just sew before. Leave it for a moment, we'll go back to the bag body after. Sew two parts of cuts for strap into one like the photo below. Fold into a half, sew. Turn it over. You can use pencil/chopstick/bamboo skewer to do this. Position the seam in the middle. Sew it like horizontally like photos below. Sew the fabric C. Fold their long side around 1 cm to the inside, then fold in half again, like the photo below. Now let's attach the triglides & rectangle loops to the straps. First, we put the triglides to the denim strap. Then put inside the rectangular loop. Put the end near to the rectangular loops back to the gap in the inside part of the triglides. If it sounds confusing, just see the photo below. Sew the corner of the strap, then sew. Now put fabric C inside the triangle loops. Sew the unsewn part to the flap. You can use the "hiding" technic to sew it. Put the strap with triangle loop position below the flap, with around 1 cm of strap overlap with the flap. Sew around 0.5 cm from the end of the strap. Then bring the strap to the top, covering the seam that we just sew. Then sew it few more times with square shape to make it strong. Do it to the other strap. Position the straps around 3.4 - 5 cm from each other in the middle-back of the bag. Now sew the other side of the strap to the bottom of the body around 11-12 cm from the left/right sides. Sew it for a few times to make it strong (sorry, no photo for this step). Prepare a small fabric for the hook. Sew it like when we sew the closure string. Tied the end then sew it to the middle part of the flap. Sew the inside pocket (fabric I) to the lining (fabric G). Fold the to top part of fabric I, then sew it. Fold the remaining sides, then sew these side to the lining fabric. Sew both sides of bag lining together. Meet the good sides together, then sew the left and right sides. Leave the bottom part open. Now we are going to attach the lining to the bag. Fold the top part of the lining around 1cm to the bad side. Meet the lining of the body, with the position around under the jeans' button. Sew it by hand. If your sewing machine can sew it, then use a machine to sew. Now we are going to finish the bottom part of the bag. Sandwich the dacron/batting between the bad sides of bottom fabrics (fabric B and H). Sew all the sides together. Now we have to sew the bottom fabrics to the body. Mark the middle of bottom fabric with the middle of the body fabric. Meet, pin, sew. If you have eyelets punch, that's good. But if you don't, just use the traditional hammer and pliers. First, mark the part of the "waistband" where you want to put the eyelets. Give space around 5cm between eyelets. For the back part, place the eyelets around 2 cm on the right/left of the flap. Make a hole by cut the fabric a little bit then use a screwdriver to make the hole bigger. Place the eyelets in the hole, then punch the "bad" side of the eyelets on the bad side of the waistband with a hammer. Be careful when you do this, and it is always safer to use some gloves, just in case. Put the string, add the cord lock, then make a knot at the end of your string. Thank you for hang in there and finally finished reading this long tutorial post. We know that there are few steps that might be confusing and not really clear. Therefore, if you have any questions, please feel free to ask us. Thank you for reading until the very end. That is very clever! Thanks for sharing! I loved all the photos, it made the whole process very clear. Thanks for sharing. Thanks so much for this great tutorial. I know it takes much time to put all this online. you sholud make a video with this tut!! :D I liked it! Perfect timing. I was just at the thrift store this am and picked up a pair of jeans for .39. Now I know what I'm going to make with them. Thanks for the detailed tutorial. This is one of the cuter bags I've seen. Where do u get the rectangle loops and triglides? Could you hand sew this as well? I discovered your site last week, and decided to make that bag! So I followed your tuto steps by steps, and there it is! I finished it today!! Thank you so much for sharing!! Wow, I love your idea. You've made a pretty backpack. Do girls wear tight jeans to make guys look? I don't understand how to attach the bottom of the bag. Can anyone explain? Thanks. denim backpack. Thanks for your nice post. I am waiting your next post. WOW!! What a gleaming thought presented in this post Denim Backpack Tutorial. We appreciate and will certainly try this, being a reliable School Backpack Manufacturers. Can not see any of your photos is there a reason?